My newly published booklet, A Prophetic Manifesto, is all about trumpeting a warning cry that our nation has passed the point of no return and that God is now in the process of withdrawing His protection, allowing us to implode. The second half of the manifesto focuses on the signs that clearly indicate that we are at the end of the Church Age. Based on those signs that God's Word tells us to watch for, I assert that Jesus is at the very gates of Heaven, waiting for His Father's command to return. But is that message being urgently proclaimed from our pulpits? No! The Church is asleep. Pastors are more concerned with attending church growth conferences and trying to catch up with the latest fad in worship entertainment. Even worse are those who mock the signs and scoff at the idea of the Lord's return anytime in the foreseeable future. Meanwhile, our society continues to secularize and paganize at breathtaking speed, and true Christianity is coming under increasing attack. Is there any hope for our nation? I do not think so. Our only hope is Jesus, and thus we have no hope, because our nation has rejected Him. But there is, of course, individual hope for those of us who know Jesus as our Lord and Savior, and I conclude the manifesto by talking about that hope. At our annual Bible conference the last weekend in June, we distributed the first copies of A Prophetic Manifesto. A manifesto is a brief statement of principles, and that is a good description of our manifesto. It is only 40 pages long, and it contains a declaration of biblical principles concerning two issues: the fate of our nation and the return of Jesus. The cover is stark in nature, printed in black and white, containing only the title and the name of the author. It is intended to set the tone for the hard-hitting message that the booklet contains. The booklet is aimed primarily at pastors, calling them to a recognition of the terrible moral and spiritual condition of our nation. Its message is also designed to alert them to the fact that we are living on borrowed time and that they need to start preparing their congregations for the Lord's imminent return. 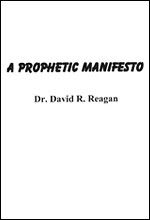 In the introduction of the booklet, I pointed out that it is titled, "A Prophetic Manifesto," not "A Prophecy Manifesto," and I stated that the difference is important. My purpose was not to present a prophecy given to me by God. I have no such prophecy. Rather, my purpose was to share some sobering truths that are based on prophecies which God gave to biblical prophets thousands of years ago. They are also based on principles the Bible reveals about how God deals with nations. The Manifesto is a shout of warning to America and its pastors. Please consider giving a copy to your church pastor. Copies are available through our online resource center. My first reaction to this was "Oh, great, there goes Lamb & Lion bashing the greatest nation that has ever been in the history of the world". And part of me still clings to that reaction. That's probably because I don't want it to be true. But, tragically, another part of me knows the America I grew up in is on the verge of being no more. The secularits, the pornographers, the violent, the marxists, the socialists, the queers, the politically correct, the abortionists, the dopers, the profane, the leftist media...all of these and more, though I truly believe are still very much the MINORITY, they are much more vocal, organized, supported and powerful than the decent moral MAJORITY. I am forced to acknowledge the truth in Dr. Reagan's words. And as much as I wish it could still be turned around, I have a gut wrenching feeling it is indeed too late. As I type that, I realize we, the majority, share in the blame. What the hell have we done to stop it???!!! Perhaps I'm being too hard on us. COULD we have done anything to stop it or is it inevitable that evil will rise in the end days. It is by the grace of God that He will have His Son Jesus remove us from this world. A world in which we don't belong. Our time is nearly over. Yes, the Chruch Age is coming to a close. While sad for the rest of the world, it is a blessing to us. They shall rejoice at our passing. Hey billy are you on the christ in prophecy facebook? if not get on it. So, don't look me on Facebook, not just any time soon, but at all. The cross currently displayed on thsi page that is "filled in" with and American flag is quite ironic considering the content of this article. I'm not sure the Bible agrees with your argument Dr Reagan. I'm from New Zealand and you can turn around and say what about this country or Australia, or a host of other historic "majority Christian" country and given the same vocal secularization, divorce, social evils, gay marriage etc, why has no one come round and asked why God must pay the USA specuial attention and not the UK, etc? After all, we are from a country that its people still call it "Godzone" informally and our national anthem title is "God defend New Zealand"! If you want to put forth the argument the USA was founded explicitly as a "Christian nation" this country has even more reason to do so. There has never been a country that can say has a special relationship with God (with the exception of Israel). The US founding fathers are a mostly godly bunch of great men, no dounbt about it, but the fact they had promised to God of founding a nation as a Christian one has no bearings on God because God has not asked them to do so in this dispensation! In sum, Romans 13 tells us that regardless of the human processes that lead to their appointment, all earthly governments are instituted by God himself. And WHY does he give them power? To administer justice, and to bring order to society as they work for the good of their citizens. Governments receive their authority from God himself. In some sense they reflect his universal authority – and we could almost say that they mediate his authority to the world, almost as though God chooses to govern societies as a whole through his appointed governments. This means that no government needs to be in any sense ‘Christian’ to be legitimate before God or binding for God’s people (as we’ll again in a moment from looking at what Jesus said in Mark chapter 12). This is true of all kinds of institutions in our society – including families, businesses and schools. All these things can be a blessing to people and to society as a whole, even if they are not Christian. This is certainly true of governments – which, incidentally, is one of the reasons that today we can reject the notion of pursuing a “Christian nation”, and why we believe that the modern-day nation of Israel has no special place in God’s purposes (as OT Israel certainly did). With this God-given authority, governments have the right to make and enforce laws (Romans 13:4). For example, the government has the right to decide that there is a bus lane on Shirley Road between the hours of 3-6pm. And even if I don’t like it, they have the right to fine me $150 for driving in it! Those who resist will incur judgement. J. from New Zealand, I refer you to Parts 1 and 2 of this interview concerning the founding of the United States. Nathan, I'm still not convinced by the video. I have already had what you linked to in mind when I made the first comment. You need two parties to make a contract, if you try to make a pact with a person who plainly said there will be no requirements to have a pact, it simply is not recognised. Don't get me wrong, I believe all these things are symptoms of a fallen society, but the way the Bible said it, the world is already condemned of its sin from Romans 1. We will never expect or build a society that has a remotedly Christian component. (Aside: a Christian teacher at my church recently pointed out arguably the country which is the most Christian in the world is South Korea, and I look at the statistics that even the Rep of Korea has 25% with no religion and 30% Buddhist and other traditional religions. He is from Australia from Anglican backgrounds, so probably doesn't think much about the common type of American Christianity), 2. Christians are to preach the gospel to everyone, and be honest witnesses in society as in Romans 13 inclusing all civic duties, and 3. wait for the rapture and the millennial kingdom. God's providence guides nations rise and fall in this dispensation. For us at this satge, much of the world is awaiting the judgment and then reaugurated in the millennial kingdom. I welcome any corrections if what I presented are not biblical. J. from NZ I also reject Replacement Theology! Do you realise that the Abrahamic Covenant, and the New Covenant are both eternal, unilateral contracts with no conditions for mankind other than to believe God to keep His word! Not understanding this Divine action goes a long way to explain the existence of Replacement Theology imo. I agree with you that we are going down. I hate to see it because there are lots of good God fearing people in America. But I can see no way of stopping it. I think that the vote in Nov will tell us a lot. When Obama won last time I said that America had just rejected God for what they thought would be good their own interest. I do wonder,though, that in a way America didn't reject God with that vote, I think a lot of them were fooled by the Devi. A lot of people don't have internet or cable, so they were taken in by the Obama and Democrat owned local stations, which were all of the stations.. But now it is clear that what he is. So this election they are choosing.. They know his stance on Abortion, Partial abortion, and dispicable gay right. Anyway, to me November will seal our fate. Too right and spot on! The British Empire was used by God to take the Gospel into the wide world by amazing Christians such as George Whitfield, followed by the Wesley bros. British men and women were used of God at a time when travel was long, difficult and dangerous. The sun didn’t set on the British Empire, and where she conquered God’s Word went forth by His will. Great Britain’s power and influence far exceeded what one of her modern ‘children’ has been able to do. But we aren’t in competition; it is the Sovereign God who determines what deeds we will do in His name. Even the dark prince and his cohorts’ are under the rule of His Divine Majesty. While apostates feebly ‘bind and loose’ the devil, they forget that he too is at the beck and call of God Almighty as they foolishly ‘do battle’ against the will of God Himself. He is using Satan to test our hearts and faith; we either crumble in fear, or actively BELIEVE the Promises of God and apply them by faith to our lives. When the disciples feared the wind and waves of a demonic tempest, Jesus wondered at the weakness of their faith, then calmly HE spoke, and the wind and the waves subsided as the disciples looked on in wonder at yet another miracle by their Master. The fabulous opening of the Olympic Games in London told only half the story of how Britain became ‘great’. A scant nod was given to her Christian heritage even though prayers are still said in Parliament, acknowledging that the God of the Bible is still at her helm. What it did reveal to the world (if she but knew it) is just how far Britain has sunk back into the black pagan mire God raised her from. Frighteningly so! Did anyone notice the elongated pyramids raised around the arena perimeter, providing 13 apertures to hold the ‘all seeing eye’, the Masonic symbol that is also ensconced on the U.S. Dollar. SO much more beside. Great Britain has been ‘going down’ for a long time, and the U.S. is following suit as Pagan beliefs are sewn into the fabric of the visible ‘church’. BUT God – will not pull up the tares with the ripening wheat lest it also is harmed. This is discipline; that the U.S. is now facing along with the British Empire and her Commonwealth, for actual judgment is due to come AFTER the Rapture of the Church/Wheat when she is safely stored in the heavenly barn. Meanwhile, the invisible Church must put every effort into taking God at His Word and believing with every ounce of her being regardless of the imitation church claiming otherwise. The more reproduction that one has ingested, the harder it is to recognise a forgery. Get into the Word alone, and read it from cover to cover, trusting the Holy Spirit to expose the false teaching as we absorb the TRUTH of His Doctrines, thus scouring off the myths distributed by the spirit in the ‘present and incorrect’ Harlot Church who propagates ‘mysteries’ forbidden to us by God.